What a turn around, I left Western Sahara in January after a six month deployment and in August I find myself back in Africa. The sights and smells of an African airport seemed to have changed little as I arrived, close to midnight, having departed Dublin at some unearthly hour that morning. 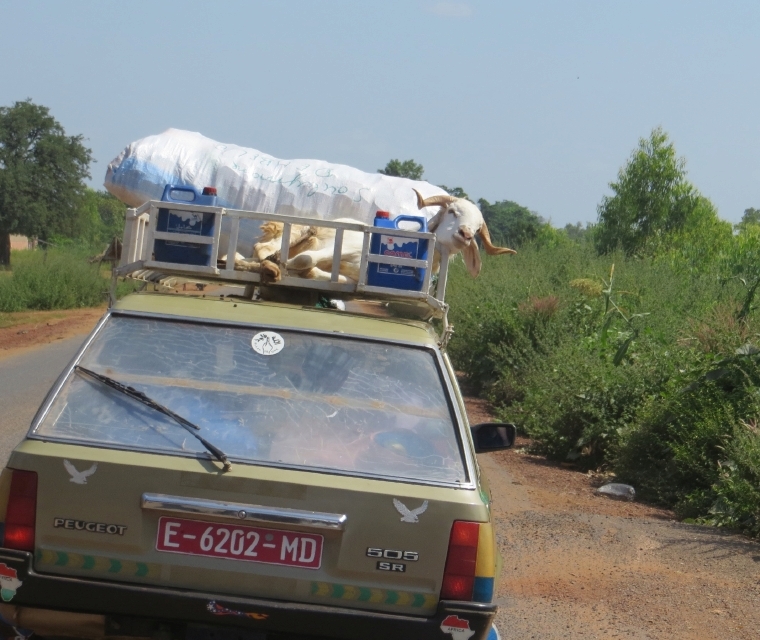 Bamako airport lies some 30 mins drive from the city and the journey to the Mission Head Quarters was a cacophony of shrieking horns and squealing brakes as it seemed that all 1.2 million inhabitants of this vast city were on a mission to run each other off the road. So why is an Irishman in Mali? 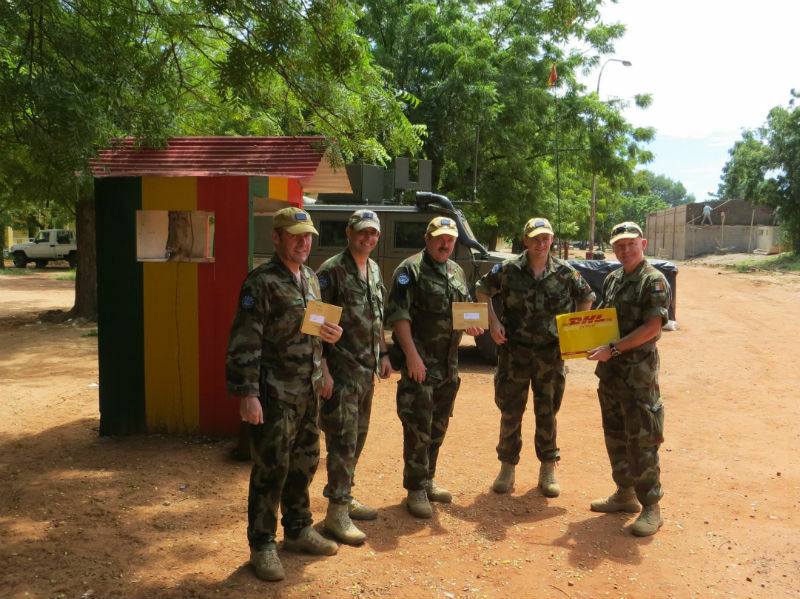 I am here as part of an eight person, Irish Defence Forces Training Team deployed with the European Union Training Mission to Mali (EUTM Mali). This is part of Europe's response to the conflict that erupted here last year that threatened the stability of not only Mali but also some of the neighboring countries. The current political, humanitarian and security crisis in Mali has its roots in an insurgency that started with some Tuareg groups in the North of the country. On January 17 2012, fighters from the National Movement for the Liberation of the Azawad (French: Mouvement National pour la Libération de l'Azawad, MNLA) attacked the towns of Ménaka, Aguelhok,and Tessalit in northern Mali. The MNLA's rebellion, like other Tuareg-led uprisings before it, reflected long-held grievances and bitter historical memories among some Tuaregs. Fighters in 2012, in some cases the same men who had fought the Malian army in 1990 and 2006, or whose fathers had fought in 1963, felt that postcolonial Mali had marginalized and victimized them. The MNLA dreamed of founding an independent state, "Azawad," comprising the northern Malian regions of Gao, Kidal, and Timbuktu. 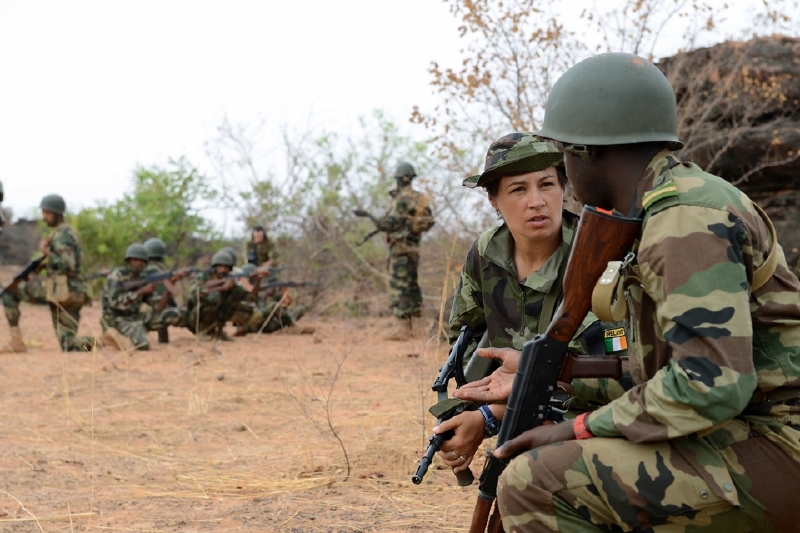 Irish troops training the Malian army. Mali's crisis has drawn the concern of the international community, especially Mali's West African peers. 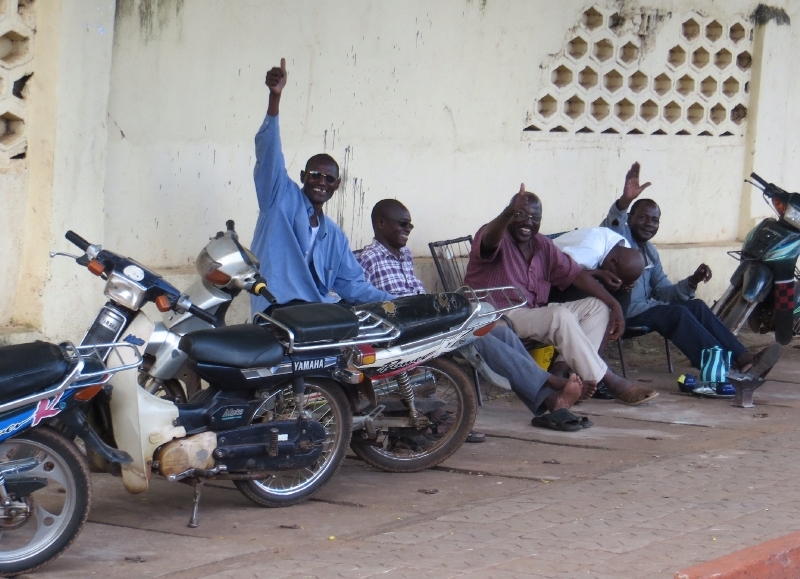 stability of Mali and its neighbors, many of whom face political and humanitarian crises of their own. Security concerns, finally, include the presence of militant organizations such as AQIM (Al Qa'ida in the Islamic Maghreb) and MUJWA (Movement for Unity and Jihad in West Africa) in Saharan and Sahelian Africa, as well as Mali's role as a transit point in international drug and contraband trafficking. A French-led military intervention in January 2013 drove Islamists from northern cities, effectively restoring Mali's territorial integrity. A two-round presidential election in July/August 2013, was won by former Prime Minister Ibrahim Boubacar Keïta, commonly known by his initials IBK, who wields political authority in the capital and surrounding areas but has yet to reach a comprehensive settlement in the north of the country. As Mali looks toward 2014, the country remains in crisis, recent events in the North of the country include a suicide car bomb, detonated outside a Malian Army barracks in Timbouckto, an attack on some Malian soldiers guarding a bank in Kidal and an attack on a UN post that killed two Chadian soldiers and seriously wounded a further twelve in the town of Tessalit. It should be pointed out however, that distances here are vast and Timboucktou is nearly 1000 km from the capitol Bamako and Tessalit is a further 250 km to the Northeast. Mali is one of the poorest countries in the world, ranking 182 out of 186 on the United Nations Development Program's 2012 Human Development Index, yet the people are friendly and industrious. Streets are crowded with people trying to sell every sort of ware imaginable and the city throngs and heaves from early morning until late at night with people travelling, moving and selling. 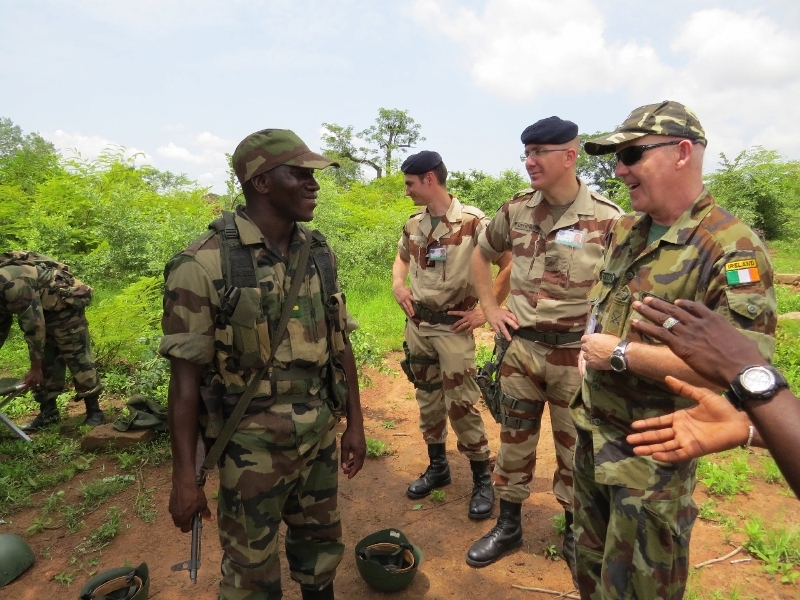 The EU mission here, (to train and up-skill the Malian army) is already 6 months old and so far two Battalions, of approx. 700, troops each, have been trained and deployed to the North of the country. It is planned to have another two Battalions fully trained before Christmas. The EU Mission comprises of a Headquarters element in the capitol, Bamako, consisting of approx. 120 personnel and a Training element of approx. 400 personnel based in Koulikouro, which is a town about an hour's drive East along the Niger river. In total we have personnel drawn from 23 European countries, plus a helicopter medevac team from South Africa, so there is an interesting dynamic in how we interact with each other. English is the official language of the mission but as French is one of the primary languages spoken in Mali, it tends to be mainly spoken in the Head Quarters, needless to say my Leaving Certificate French has been considerably dusted off and hastily revised. Go On Munster!!!! Note the Munster and Gloucester flags - this is interesting, because in the joint Irish/UK training team, we have troops from both areas and as you can see they got their Malian trainees to urge support for their respective teams. Pirougues on the Niger River. We normally start each day with a run at 0600hrs, before the African sun starts to make exercise unbearable, and then commence work at 0800hrs finishing with the evening brief which starts at 1800hrs. On Saturdays we normally finish in the afternoon and Sunday is our one day off. The days seem to blend into each other and I am frequently out at the airport in processing new troops or visiting the training camp in Koulikouro. This camp is only 50 km away but the journey can take up to 2 hours depending on the vagaries of local drivers who seem to have no concept of either reality or safety. Overloaded buses overtake on any side of the road, and then pull up suddenly if they see a potential passenger emerging from the bush. Needless to say indicators are never used and many vehicles are held together by pieces of string, literally. 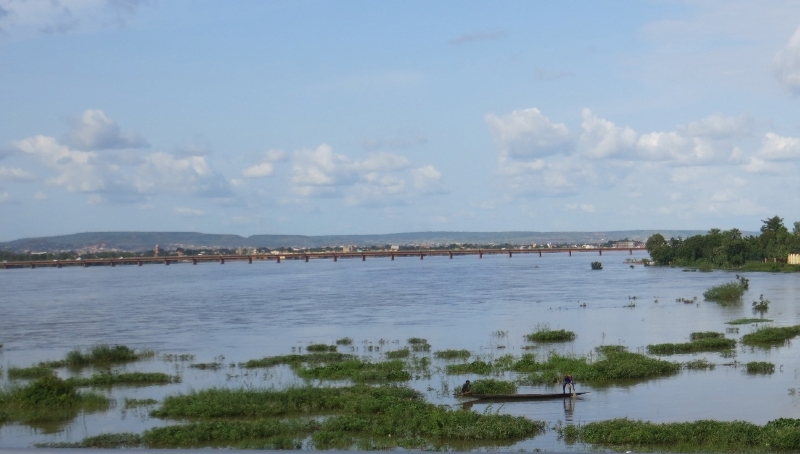 The Niger river flows rapidly through the city and at present is nearly 2 km wide in places due to the rainy season, crocodiles prowl along its banks but I have yet to see a hippopotamus, although I am constantly told by locals that they are there. Heavy rains some weeks ago caused one of the tributaries of the Niger to burst its banks and swept through a collection of mud huts and shacks illegally built on the floodplain. The final death count was 52 with a further 20 missing. One of the interesting places I managed to visit recently was the Arch of Khamadjan which is about an hours drive west of the capitol. This majestic arch is sacred to one of the more ancient ethnic groups here in Mali, the Mandinque, and you can see why. 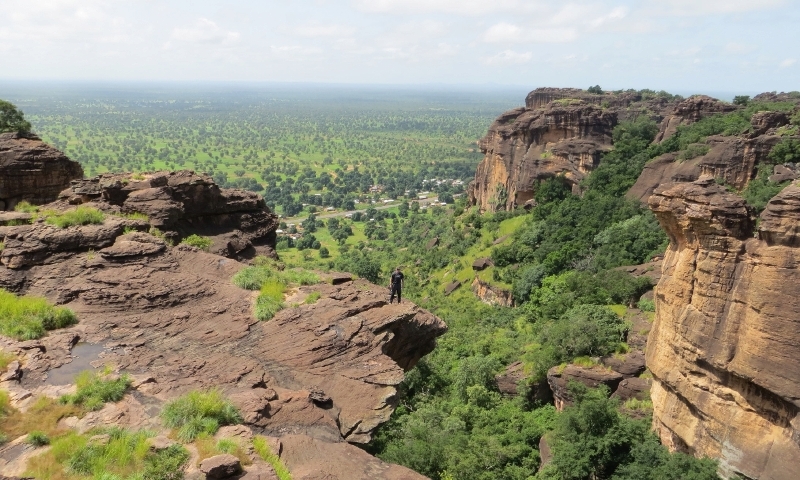 It is an impressive testament to geological factors and has spectacular views from the top, although the ascent is not for the faint hearted. Above the Arch of Khamandjan. As the rainy season draws to a close, the temperature hovers around 34 degrees but unlike Western Sahara, there is a lot of humidity in the air and this takes its own toll. Ordinary tasks take much longer to finish and there is a constant need to keep rehydrating. While it might appear a world away, and in some regards it certainly is, we are not forgotten about and as you can see in the accompanying pictures the postal votes for the recent referendum arrived courtesy of DHL and I then distributed them to my colleagues in Koulikouro. After three hot months here it is now time to look forward to some leave and try to readjust to what no doubt will seem to me to be arctic conditions in Ireland.